A $5 shot-and-beer deal, half-off appetizers and other happy-hour deals around downtown Seattle. Happy-hour spots in downtown Seattle function a bit like an airport bar. Service is — in theory — faster so office workers don’t miss their bus or ferry. And tourists and out-of-town suits often sidle up to the bar. Happy-hour menus change more frequently in downtown establishments than in your corner dive. It’s a cutthroat market. Below are five new downtown happy hours, and by the time you read this, there will likely be another five popping up. The happy-hour menu has been revamped and expanded with more bar bites. There’s a $5 shot-and-beer-deal and $6 two-ingredient cocktails, simple and fast drinks for those office workers on the run. If you have time, order the happy-hour roast chicken, which takes at least 20 minutes to cook. It’s dinner for $17, a salty, juicy half-chicken served with some buttery lentils. Café Hitchcock is also a good backup if you can’t get into Metropolitan Grill’s wildly popular happy hour. To the uninitiated, a host at that steakhouse will take your name down until a bar seat opens up. I’d rather walk around the corner to Café Hitchcock than go through that madness for an $8 cheeseburger. Downtown bars usually aren’t big enough to accommodate large office gatherings. But this Orange County, Calif., chain can hold about 450. A new bar menu has been launched with Korean wings and pork lumpia. Appetizers are half-off during happy hour and drinks (beers, wine and cocktails) are $2 off. It’s a steakhouse for the expense-account set. But at least it has happy hour for the rest of us. There’s a new $10 cocktail menu. 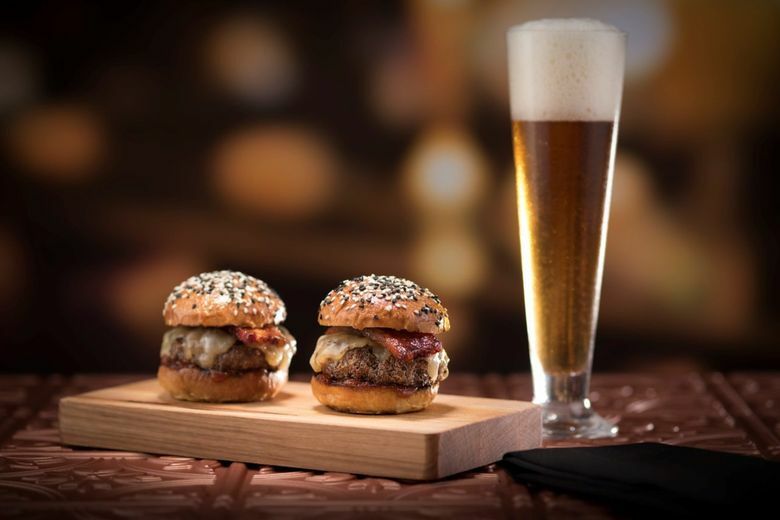 Sliders from Korean-style fried chicken to a candied bacon cheeseburger go for $10-$12. To share, the charcuterie-and-cheese plate goes for $15. Quietly, the swanky, new Loews hotel has launched happy hour at its bar. And it’s not as crowded or as loud as other downtown watering holes. A bowl of mussels goes for $5.50. For something more substantial, cheeseburgers and fish tacos are less than $10. Beer ($3.50) and wine ($5) are discounted, but the better deal is the $25 bottle of vinho verde, a nice pairing with seafood. Every third Thursday of the month, there’s its oddly paired golf-and-beer happy hour, where you can get a flight of beer and play 30 minutes of virtual golf for $15. Fore!